Is Jim Hansen's Global Temperature Skillful? | Watts Up With That? Is Jim Hansen's Global Temperature Skillful? The three warm-color time series are taken from Hansen’s published testimony in June 1988 in which global surface air temperatures were projected under three scenarios by his global climate model. The result suggests the old NASA GCM was considerably more sensitive to GHGs than is the real atmosphere since (a) the model was forced with lower GHG concentrations than actually occurred and (b) still gave a result that was significantly warmer than observations. August 13, 2010 in Forecasting, Modeling. What I find equally disturbing is how Hansen is continuing to adjust post 1998 numbers upwards, and now shows a strong warming trend over the last 12 years which is not seen by UAH, RSS or HadCrut. …..what is this world coming to? What’s with looking at the facts? That doesn’t instill a sense of fear. Hansen is an environmental wacko and should probably seek help. So, he was wrong even if we had followed his advice. Nice. For the sake of us unwashed, could you explain “The observations are global tropospheric temperatures adjusted to mimic the magnitude of surface temperature variability and trends according to published climate model simulations (i.e. a reduction in satellite anomalies by 0.83. )” in a bit more detail? I am guessing it lowered the overall height of the observation curve? Is Hansen waiting for someone to offer him ketchup for the crow sandwich? “After tying all time series to a 1979-83 reference mean, one can see the significant divergence in the results.” Divergence is in the eye of the beholder, just ask Lisa Jackson or Obama. Divergence what divergence indeed! My thanks to Dr. Christy for this insight. So, if I use the name “Monckton” will our new found friends from RC come back and take a look at this? Many of them seemed convinced of Hansen’s infallibility. Amplification of Global Warming by Carbon-Cycle Feedback Significantly Less Than Thought, Study Suggests. See here and here. Prognostication is an art, not a science. Hansen is neither but he does seem to have a PhD in BS. If the poor guy weren’t in such demand and so busy on the Snake-Oil Salesman Chicken or Beef Circuit he’d have starved in the early 1990’s. Fortunately, it’s still true that there’s a fool born every minute; and some people like Hansen and his mentor (FatAlbert) have a gehnak for the theatric. I perceive that we have an honored guest with us in The Village (a hero some might say!). So the village idiot promises to be on his best behaviour (as he was when Lord M. dropped by – though my appropriately servile comments were restrained in the Gatekeepers – oops Moderators – dungeon). Just one point, JC. You’re a busy guy, slagging off Jim ’bout his take on things in June 1988 (22 YEH 22 years ago!!). With all due honor and respect that applies to this domain, I don’t seem to be able to ferret out what you had to say for youself back then. Care to enlighten us? Hey, I’m just an idiot..but i thought science sort of…moves forward…I certainly have in the last 22 years. Why are you so hungup about Jim’s understanding of things 22 years ago? Don’t you feel fulfilled in the way your own career has panned out? Do you feel that slight envy that Hansen is in fact…..well….pretty close? But aren’t these actually scenarios where scenarios are images of the future, or alternative futures? They are neither predictions nor forecasts. Rather, each scenario is one alternative image of how the future might unfold. Hence the fact that scenarios show little resemblance to actuality is in no way indicative of a problem with the underlying model. In fact, the models have proven themselves to be robust, in that they are consistent with climatological belief. fortunately hansen has his own temperature dataset which more closely corroborates his testimony. and every month, it gets closer! By the way here is the Rasool and S. H. Schneider paper predicting an ice age in 1971. It’s about time somebody in the field called out Hansen on his out of whack “scenarios”. Please know that however much derision and approbation you may receive from “consensus scientists” your efforts to uphold the standards of impartial, empirical science are appreciated by a great number of people. Excellent article. And I agree .. Hansen is not skillful. ON ANOTHER NOTE … I have ONE HUGE question. I’m beginning to wonder if something has gone ary with the data sensor on the satelite. Looking at all the previous years of data, it seems there is a relatively sharp peak of temperature in the summer. However, this year looks like a car that the power steering has gone out, and it making this wide swing. Have you guys noticed this at UAH? Is this wide swing at the top for real? When the theory makes a prediction that does not agree with observations then the theory is wrong. Wow, if this La Nina matches 1999, he’ll be off by 0.7C, the same amount as all the warming since 1850, based on the fact that CO2 levels will be at his scariest scenario. Unfortunately, other than the fact that this tells us his analysis was not “skilful”, this doesn’t inform us about what would be a more realistic number for a doubling of CO2, because he only based his assumptions on that one variable, when we know there have been far more factors at work, like the PDO and AMO warm phases, the active sun now gone quiet, and the extra El Nino. Hansen treats facts like a vampire treats sunlight. Yes, science has moved on…. But Hansen hasn’t. He has “adjusted” the GISS data to conform with his 1988 vision, which is why it diverges from the satellite data. His current projections are just like his 1988 projections, way high. Why the reduction to 0.83 of measured? The models typically predict more warming aloft than at the surface — typically 1.2 times as much. So if you have measurements aloft (as from the satellites), and you want to infer the comparable surface values, you multiply by 1/1.2 = 0.83. Because if he was so wrong in the past why should we re-structure our whole global energy infrastructure based on anything he says today? People are more cautious than you perhaps as our careers earned us what we have and we’ll be damned if we rely on someone as dangerous for humanity as Jim. If his prediction was about the frequency of supernova in our galaxy no one would give a damn if he got it wrong. A wild guess but I am venturing tthat looking at time lapse CT and the shape of DMI NH ice extent curve, that melt is about over and that we are about to get one hell of a surprise. The point in question is not what anyone else said about the climate 22 years ago, but what someone DID say about it, and how those predictions have turned out. Also: “pretty close”? I may be misreading the chart, but it looks like Hanson’s predictions were for a 0.8 C to 1.2 C rise by 2010, whereas the observed is around 0.5 C. ??? The models have proven themselves dead wrong, since they model/predict climate behavior that does NOT occur, even when actual CO2 levels – the models’ most important input (CO2 levels) – are far greater now than the levels used in the models. Reid/Obama/Pelosi are DEMANDING new taxes of 1.3 trillion dollars as a penalty/requirement for using energy based on Hansen’s predictions for the next 90 years. Well, here we have Hansen’s predictions for the past 20 years. And, we find Hansen is dead wrong. And, further, we find that the entire CAGW community of supposed scientists completely unable to either explain their problem, recognize their problem even exists, nor correct their problem with their precious CO2-induced CAGW theory. Is there a problem using 20 year old theories? Well, Hansen relies on his (unverified and unsubstantiated) 1987 paper to justify extrapolating temperatures 1200 km away from measurement sites. What “new” and “corrected” temperatures has Hansen predicted the past few years? Or has he been too busy talking to friendly reporters, supporting riots and testifying (falsely) in British courts to stop badly-needed new energy sources to actually do “research”? Guys, i got a question about HadCRUT temperature record. Anyone knows what happened in 1879 ? I mean that has to bo the strongest warming and cooling rate ever. And that’s a warming event lost in a cold background, so it’s kind of an anti-volcano event. 4 years ago recent enough for you? See below. Naw, he simply did a study himself stating that he was essentially correct. lol, somethings a man has to do himself. And if you don’t know who to believe about Hansen’s study, well, just ask him! He’ll tell you he was right! This post adds more weight to my idea that we might see some career moves in NASA during their next human resource evaluation cycle. Does the recent satellite sensor issues affect UAH temperature data? Just curious. Here is the global warming signal at the Arctic. I have, it seems a bit off to me, too. Oops – Do the recent …. This is elegance in simplicity. The true d[snip] are the warmers. Wait & see the divergence increase over the next decade as 1st the PDO goes cold (already starting), followed by the AMO next. Then everyone will come to the same conclusion most skeptics have already come to – natural cycles dominate the signal & GHG’s are bit players at best. Why are you so hungup about Jim’s understanding of things 22 years ago? Simple answer, because their predictions do not pan out. Not even in 20 years. No one’s understanding of things has changed that much in 20 years. What we don’t know still far surpasses what very little we do know, and that has not changed. Jim?? I hope you meant that as some sort of idol worship thing. The 0.83 is a cheeky ploy. Christy is assuming there is tropical tropospheric “hot spot”. Christy is taking a model result that tropospheric warming should be amplified by 1.2 over the surface. Then he’s taking the satellite record, and using that ratio to work backwards to what the surface trend would be. This, because he says the actual measurements at the surface can’t be used at all. So basically, Christy assumes the models are correct, (and also that UAH/RSS are correct), and ends up deciding the models are incorrect. This is nothing new; it’s just the same old argument over the existence or non-existence of the predicted tropospheric hotspot, inverted. But it lets you make a more impressive looking chart. Because if Hansen’s mythic powers of prognostication are going to be used as an excuse to shatter the remnants of our economy then we should know just how accurate he really is. Since we are unable to know for certain what the future will look like in 20 years, much less the 50-100+ year scarenarios propagated by Hansen and his ilk, then we must look at their older prophecies rather than checking their constantly updated ones which can’t diverge as much from observed reality (and how Hansen observes it) for simple temporal reasons. Yeh, I hate it when they start going all “satellite climate science” wordspeak. Makes for a hard read, fortunately this was a short article. I’ll try to give an explanation. The “observed” temps are temps from satellites, apparently both RSS and UAH data sets are used. However, these are not the same data sets used in Hansen’s models. Hansen used surface temps, (I presume his own, GISS) A surface temp reading does not equal a satellite read. The satellite is measuring the heat in the troposphere. So, an adjustment must be made to attempt to equate the temps. In this case, apparently -0.83. I hope that helps you and some of the others. I don’t favor this kind of comparison, but given the corruption of surface temps data, this is probably the best set of tools, and obviously, Dr. Christy used accepted scientific methods for the comparison. … shouldn’t the comparrison be used with GISS rather than UAH and RSS? I think folks like James Hansen and Tom Karl realize they have a rapidly approaching expiration date. In a couple of years a new administration will likely scour the pseudo-sciences out of NOAA and NASA/GISS. Then what will they do? Gentlemen like Drs. Christy and Spencer (and Lindzen, Soon and many others) are at the top of their game right now. What was Dr. Christy doing 22 years ago? Probably trying to figure out if any of this made any sense in the real world. I see folks like Briffa and Mann slipping into irrelevance and…alas…James Hansen slipping into something akin to pre-senile dementia. Your fine example of integrity, honesty, and adherence to sound scientific principles are primary reasons why I send my daughter and money to UAH (budding electrical engineer). I find these commendable values throughout UAH and the Huntsville area. I intend to encourage my son to attend UAH when he graduates from high school and will continue to support UAH in any way I can. Looks like an exaggerated and lagged response to the 1877/78 El Nino. Keep in mind that the global coverage was very poor back then, so the data is more volatile. Three things ZT, first, of course they are predictions. If they weren’t predictions then why didn’t he list 10 alternate future paths? He only listed 3 because that is the way he thought things would most likely turn out. (many of us call that “prediction”) The reason why this matters, is because HE TESTIFIED IN CONGRESS ABOUT THIS LUNACY. LAWS HAVE BEEN PASSED BECAUSE OF HIS UNFAMILIARITY WITH THE WORDS, “I DON’T KNOW.” Industries have died, careers and livelihoods ruined, resources have been diverted from real problems. In many ways the EPA’s new found authority to regulate CO2 as a harmful gas stems from this wildly irresponsible man’s actions. Secondly, “….in that they are consistent with climatological belief.” Yep, belief is about the way I’d put it too. Perhaps theology, but belief is good. Thirdly, “..In fact, the models have proven themselves to be robust,…” If by robust you mean consistently wrong, then yes. See the 3 alternate paths of the future, none of them happen to be correct. Oddly, they undershot the CO2 ppm but still overshot the temps in every case, (I feel the need to reiterate the Dr. Christy’s conclusion) meaning they have no idea how much CO2 effects the earth’s temperatures. But what we can conclude from Dr. Christy’s submission, is that they greatly exaggerate its importance. But, I digress. What, pray tell, does robust mean in the sentence you used? Also, Dr. Christy is more familiar with the sat. temps, it’s what he works with, so naturally, he’d use them. Dawson died before his Piltdown Man skull was exposed as a fraud. It took 40 years to expose the fraud. How many years, V.I., should we give Hansen and Karl before they are exposed to the world? I expect they are conjuring up their next “skull” as we speak. Hansen disqualified himself as an expert after his first model. He lied and Karl swore to it. Allegedly. We are charitable to concede that this was an honest mistake or an unintentional prevarication. Their “models” should have the same position of honor in history that the Piltdown Skull has today. There’s a number of questionable assumptions and statements in this post. First, as carrot eater notes, the actual empirical temperature trend has been made as small as possible by first using the satellite data and then further reducing on the basis of the model prediction that the temperature trends should be larger at the surface than in the LT satellite product. So, you have a bizarre mishmash of data and model put together in such a way as to minimize the temperature trend. 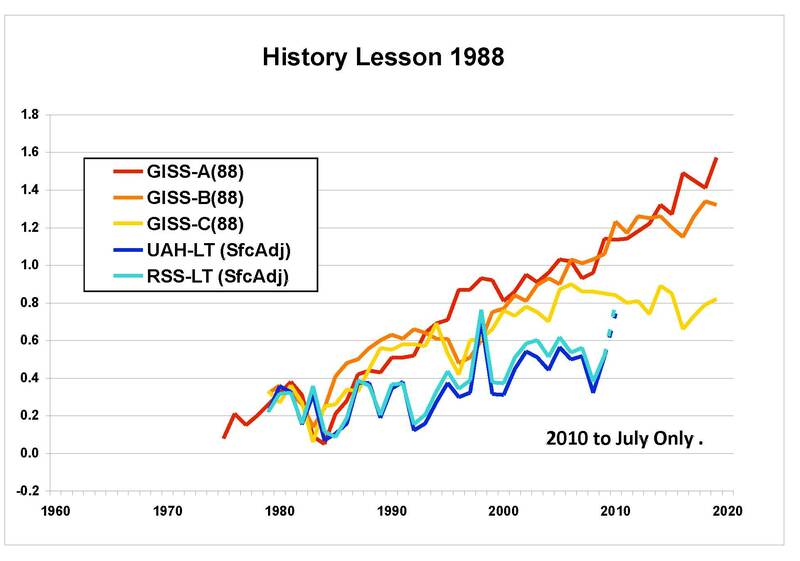 The justification for this…and not using the actual surface temperature record (which would show about a 1.5X trend) is the surface record being unreliable; however, the satellite trend is not gospel either (and I believe that there are in fact two groups besides RSS and UAH who have done the analysis and reported higher trends than either RSS or UAH). Secondly, statements are made concerning the actual emissions in relation to the scenarios that contradict not only Gavin Schmidt’s analysis but even Steve McIntyre’s ( http://climateaudit.org/2008/01/24/hansen-1988-details-of-forcing-projections/), as both concluded that the actual forcings turned out to be closest to Scenario B (if not a tad below in Gavin’s analysis). Thirdly, the relative alignment of the three scenarios is different than in Hansen’s original graph (the most complete version of which is available in Fig. 3 of this publication http://pubs.giss.nasa.gov/docs/1988/1988_Hansen_etal.pdf ). In Hansen’s graph, Scenarios A and B were clearly further apart in the later years than they have become under the current alignment. I assume this has to do with the tying of all graphs to a 1979-1983 mean, but it seems to me that performing such ana alignment actually changes Hansen’s projections from those that he presented…and seems to do so in a way that exaggerates the trend under Scenario B, at least relative to Scenario B.
You’re a busy guy, slagging off Jim ’bout his take on things in June 1988 (22 YEH 22 years ago!!). I guess thats why its good to be a climate modeler. In the short term you just claim “thats weather not climate” and in the long term you just say “22 YEH 22 years ago” and claim the latest batch of models are so much better. Just to think we could have tanked the economy in 1988 ended up with the blue temperature curve and been singing Shèhuì zhǔyì hǎo, shèhuì zhǔyì hǎo! around the sun warmed stone. No. UAH stopped using the NOAA 16 satellite way back in Dec 2006 aand went back and deleted out all NOAA 16 AMSU data from Oct 2005 to Dec 2006. From there they only used NOAA 15 AMSU until the NASA Aqua satellite cam along. Now they use Aqua and NOAA 18 AMSU data. began to diverge in a manner that suggested NOAA-16 was having problems. global trend is increased by about 0.01 C/decade. RSS dropped NOAA 16 shortly after that in 2007, also the sensor used for UAH and RSS is the AMSU, what went wrong this time with NOAA 16 was the AVHRR sensor (something that had been wonky on that bird since 2003). Sadly that lot is a patient lot. They’re still working on it. So, it that Cantonese or Mandarin I need to be brushing up on? I see math is not one of your strong points. Assuming something is correct and finding a contradiction is one of the most powerful mathematical tools. Your ignornace is noted. Hah, hah! That was very funny. I do hope that was meant to be funny. I mean, if all you can say about completely failed predictions is “science sort of…moves forward”, then you are effectively saying that all predictions are useless and we should not discount failed ones, and presumably still have faith in current ones from the same source. And because I made no predictions 20 years ago (at least on this matter) does that negate my right or ability to comment on other people who did? Why is that exactly? I think you entirely miss the point when you ask: “Why are you so hungup about Jim’s understanding of things 22 years ago?” The reason is that he is telling us we must do what he says or we are all going to die horribly, and based oin his current predictions. Good choice of moniker, it seems to fit, I’d say. If what is meant by skillful equates to taking the temperature of rooftops, parking lots, tarmacs and AC exhaust, then yes. Representing that as the real Global Temperature is the half-baked part. So the village idiot promises to be on his best behaviour (as he was when Lord M. dropped by – though my appropriately servile comments were restrained in the Gatekeepers – oops Moderators – dungeon). Our main weapon is fear. Fear and surprise . . .
ok, I’ll admit I’m pretty naive about computer modeling of climate. Does it strike anyone else as odd that one can predict temperatures several years out that follow a non-linear trend? There are several sharp up and down trend lines in the three predictions shown above. What are the parameters in the future that cause these? Isn’t CO2 going up at a steady rate? What could cause the jump in line C around year 2015? I can’t say I’ve seen a graph of future predictions that is not linear, log or follows some sort of general mathematical formula. Any help here? I seem to recall when the climate model computers were not matching “temperature with amount of Co2”, the operators started pumping more “cooling aerosol” into the computers saying “now we have a match”. Is that practice still going on? If Hansen is indeed fiddling with the numbers, or is unhinged, or is no longer competent then we are better off if he produces work that cannot be defended at all. Then everyone would be sure, he would be neutralized, and eventually ignored. It is material that looks plausible and assertions that seem somewhat reasoned that lead to bad policy. You know it would be good to keep the plot (History lesson 1988) up to date going forward – maybe on the world climate widget – since the sat data is already on it – give people the context of how bad the AGW forecast has been (and it will only get worse). Similarly, if the authors of the “Our Climate” app are reading – putting that plot on the app (with permission) – regularly updated – would have a huge impact. As they say, a picture is worth a 100 words. The average Joe will get this – it is not nearly as warm as the alarmists said it would be. Yes it is a mixed bag of data, but what do you expect? If GISS would quit with their constant adjusting of historical temps(always lower the further back in history, higher the closer to the present) it may be regarded as a bit more reliable. When you say, “(which would show about a 1.5X trend)”, isn’t that only true in regards to GISS’s temps? I agree, it isn’t idea to marry sat data with surface temps, but as pointed out, in the article “due to many uncertainties and biases in the surface temperature record, i.e. Klotzbach et al. 2009, 2010 ;” Given the knowledge of the studies, what choice does he have? Should he just ignore them? “both concluded that the actual forcings turned out to be closest to Scenario B”, true, both did. I went to the original source of the article, but sadly there was no additional information to be gleaned, so after reading your view and re-reading Dr. Christy’s statement, I think we need a bit more clarification on that point from Dr. Christy. I’m looking at the graphs, this one, the one from the original study and Hansen’s 2006 paper. There may be a slight difference in the A/B divergence, but I think mostly it is the graph’s dimensions that throw the visual off. Hansen’s original graph is so poorly delineated, it looks like a free hand, pencil job. (It was 1988) I’m having a difficult time discerning the actual predicted locations for July 2010, but the graph here seems pretty close to the original in terms of lines and points on the graph. KTWO: Hansen is unhinged, as are many in academia who must keep up the lie or lose their lofty lifestyle. It would shock most people if they ever had a conversation with an academic loon. You think 22 years in the past is a long time for a model prediction? So why do you accept model predictions 90 years in the future? They will be just as screwed up as the 1988 predictions. April: Yes such a conversation would shock many. I often have conversations with academics and I detect (perhaps wishful thinking?) growing disenchantment with Hope and Change. The retired are far less cautious about saying so, they risk less. Most people are unaware of how much outside funding enhances the academic’s income. Faculty salaries after tenure are usually quite adequate but not lucrative. Grants and consulting fees often bring in far more. It depends upon the field of course. April: forgot to say, unhinged seems likely but time will tell. As I said, it isn’t the obvious madman that produces much harm. What were your predictions of global temperature through 2020 in 1988? You didn’t graphs those. As I recall, your original claim, based on your original analysis of satellite data, asserted there was no global warming tread. I take it that your current argument is that the earth is warming but not as fast as Hansen predicted it would in 1988, but you do now agree with him that the earth is warming. Do you agree the surface of the earth is warming? Is there something in the UAH record that suggests the surface of the earth is not warming? Does the reported UAH temp attempt to measure the temp at the surface of the earth or is it some weighted average temperature in some range of altitudes in the troposphere? Hansen’s GISS data are about surface temp, and don’t measure temps in the troposphere. Your claim that Hansen’s 1988 predictions were biased would have had more weight with me if you had graphed your observed troposphere temp data along with some of the standard graphs of surface temp, say GISS, HadCrut, or NOAA. I mean what is your claim? Are Hansen’s predictions bogus or is the UAH data not actually intended to measure what Hansen was discussing? What is you current formula for converting observed temp in troposphere to observed temp at surface? Regarding skill, in 1988, even by your UAH troposphere analysis, Hansen was correct in predicting the earth would enter a period of observable warming. You denied it for many years and for many reasons. But now your UAH data shows it. Hansen’s skill, however weak, was greater than yours, in any case. I would have preferred a simplier diagram. It makes no sense to show the scenarios that turned out to be wrong about CO2-emissions (B and C), and I do not understand why there are different scenarios even for the time before 1988. What a contrived post? Hansen wasn’t predicting LT, or LT (SfcAdj) or whatever. He was predicting measured surface air temperature. His plot showed the prediction against GIStemp. And the prediction of GMST was pretty good. The author may not like GMST measures, but that’s what H was predicting. As Carrot says, using models to contrive an adjustment to satellite readings to emulate GMST is an amazing contortion. Looks to me like empirical evidence of an agenda back then. I’m glad to see an admission from a warmist that the science isn’t settled! Try a straight forward up date of Hanse’s data on his 2006 graph. Plot the GISS station data for 2006-09 (0.65 0.73 0.55 0.72) on Hansen’s graph. No wonder he is keeping quiet. Scenario C assumed green house gas emmissions stopped increasing after 2000.
here is an opinion about AGE and JamesHansen from his former supervisor at NASA, Dr. John Theon. “I appreciate the opportunity to add my name to those who disagree that global warming is man-made,” Theon wrote to the Minority Office at the Environment and Public Works Committee on January 15, 2009. Theon declared “climate models are useless.” “My own belief concerning anthropogenic climate change is that the models do not realistically simulate the climate system because there are many very important sub-grid scale processes that the models either replicate poorly or completely omit,” Theon explained. “Furthermore, some scientists have manipulated the observed data to justify their model results. He is not assuming there is anything of the sort. The ocean has a much bigger thermal capacity than the atmosphere, and a small change in ocean temperature causes a correspondingly larger change in atmospheric temperature, which lags the ocean temp by 3 months on average. B and C were part of the original and are there to display that if we either kept CO2 at a standstill or dramatically reduced our CO2, then according to the model, our temperatures would have turned out to be higher than current. In actuality, CO2 increased and yet the model overshot the result in all 3 scenarios. If the real temperature had fallen somewhere between A and C, then the model maker would at least be able to claim that he was in the ballpark. John C’s criticism is stronger for including B and C compared to reality. the scientific method demands that a theory makes predictions / forecasts about the future and if those predictions / forecasts are wrong then………… [fill in the space yourself]. This is why he is under attack for something he said 22 years ago and this is why climate scientists will continue under attack for the continued failed prediction while currently releasing press releases and spreading alarmist stories among naive members of the public. Lets leave the scientific aspects of this blog and look at the logic ! I have a Pierce-Arrow value $1,000,000 I decide to get it repainted, I am introduced to a man who says that he is a professional painter and will paint the car for $50,000. He gets the work ! He did not tell me he was a house painter ! Value of the car now $10,000. If J. Hansen is all he claims to be, lets see a exact forecast (day by day for next month) if he can tell the world that on Tuesday 14th of September 2010 at 0800 hours in New York it will start to rain and continue until 1327 hours when the wind speed will drop from 10 knots to 2.4 knots etc., THEN and only THEN will his predictions ( ah, excuse me, his self generated models) could be taken seriously for short term weather pattens. I’ve got a great deal of respect for both Roy Spencer and John Christy, but I’m not comfortable with this sort of thing. I’ve been very critical of Hansen’s predictions in the past but, in the interests of fairness, there are a couple of other points that should be considered. 1. As someone has already commented, Hansen gave a prediction/forecast/projection of warming and that’s what happened. We can argue about the magnitude of the warming but we can’t deny that warming has taken place. Hansen got the direction of temperature change right. Which (if any) of the solar theorists who are now trying to attribute recent warming to solar infuences predicted a 20-30 year warming trend in the 1970s or 1980s? 2. I don’t know but I assume Hansen’s 1980s model was relatively crude and it’s not clear (to me) that he correctly factored in ocean heat capacity. It’s worth noting that both surface and LT temperatures over land have increased at a faster rate than over the ocean and that land temperatures (only) show much more agreement with the Hansen prediction than do global temperatures. I’m quite happy to argue with anyone who claims that the Hansen predictions have been validated but equally I”ll argure with anyone who claims that the predictions have been a total failure. Professor Christy’s graph does appear to differ from Hansen’s original in that scenario B overlaps scenario A around 2015, but the relationship between scenarios A and C looks about right. On a previous thread, warmers were insistent that the increase of CO2 concentration since c. 1950 was exponential (not linear) which may be correct because it is impossible to tell over such a short period but linear or exponential, there is no way that it can be claimed that there has been a reduction in the linear growth, let alone a rapid curtailment. The question as to whether human GHG’s (mainly CO2) emissions are having a profound effect on the climate will not finally be answered for decades unless there is a temperature plunge in the next few years and no one wants that. Sophistry doesn’t help the alarmists’ case. Is to laugh. Yeah, Hansen did a “pretty good”. He hit the target, except it was the wrong one. Scenario C is the one it should not have matched. Scenario A is closest to what happened in emissions, not C.
Say Hansen predicted that if I doubled the amount I put in my stock account over 20 years (Scenario A), I would have X and if I put nothing in (Scenario C) I would have X/2. If I wound up with X/2 after doubling the amount I put in my stock account would you say he did “pretty good”? Show us how hitting the wrong target is “pretty good”. “In the early 1970s, my interest was in planets, and the editor of Science invited me to write a review paper on the clouds of Venus. Q. If you look back over the last 20 years, how do you think climate science has changed? A. I’m afraid that it’s changing in the sense of more emphasis on models, which I think is a mistake. Actually, that is only the summary of the general basis of each sceneario. The actual details of each are in this paper: http://pubs.giss.nasa.gov/docs/1988/1988_Hansen_etal.pdf (section 4 and appendix B). That is what allows one to determine that overall we most closely followed Scenario B. Climate modeling doesn’t just predict by fitting to some sort of mathematical formula. It is instead an actual simulation of the climate system and it captures many of the features of the actual climate system including the chaotic behavior that is responsible for the global temperature bouncing around as you observe. Such behavior is due to things such as ENSO (El Nino – La Nina). However, because this behavior is chaotic and thus very sensitive to initial conditions, the climate is not expected to follow the exact up-and-downs of this jiggles: the behavior of this “noise” in the system should be the same only in a statistical sense between the simulation and the real climate. Indeed, simulations with perturbed initial conditions show different patterns of jiggles…but the same overall trend due to the forcings when you look over long enough times. No, scenario B is the closest, roughly linear increase in CO2, with a El Chichon type volcano (we got Pinatubo). Hansen said in 1988 that B was the most plausible. Does anyone know the absolute global mean temperature predicted by Hansen’s code (not the anomaly) – how does this compare to the “actual” absolute global mean temperature. Also, how does his code determine the global mean surface temperature? I’ve looked through the mess that is Model E and could never find out where it is they integrate the global mean surface temperature. And to the rest of the defenders of Hansen. These two comments are what seem to be representative of much of the Hansen defense. They seem to be saying, 1. You didn’t predict warming back then. And 2. Hansen was pretty close. First, as I’ve pointed out many times, HANSEN MADE 3 DIFFERENT PREDICTIONS!!! What are the odds that some of the prediction may resemble reality in some way? Well, pretty good seeing that we was all over the board with GHG’s and temps. Let’s review, his predicted temp trend look a lot like scenario 3, yet his GHG prediction is similar to scenario 2. Unless, you want to refer to his 2006 paper regarding himself. You guys can’t seriously use Hansen’s paper as proof he’s right because he thinks he’s right. That’s ludicrous. If you prefer to use land temps as opposed to sat. data, find some other data set that would collaborate Hansen’s. Oh, what’s that you say? It doesn’t appear there are any like his? Here is the other land temp trend since the greatest increase of observed temps. Given that they share 90% of the same temps, there is absolutely no way they can both be correct. One obviously has a bias. Q,”Dr. Hansen, were you correct on your 1988 predictions” A,”Of course I was, all I had to do was tweak with the temps a bit. Here’s my 2006 study that says I was right.”<——————————– Unbelievable, but some here and other places actually do this. Here's why it doesn't matter if Dr. Christy was as skilled as Hansen in predicting the state of climate 20 years latter. We didn't pass any laws based on Christy's erroneous judgment. We passed laws that literally affected the entire world based on Hansen's erroneous judgment. Apparently, the twit doesn't know how to say "I don't know." Even when it is obvious he doesn't. I predict some will agree with me on this, but others may not. I also predict some will simply ignore and disregard this post. I'll submit this to congress and see if there are any industries, careers, jobs, lives and livelihoods we can destroy based on my predictive prowess. I'll probably do a study that looks into whether I was correct or not later and we can use that as justification for the damage done. Dang, forgot to include the link that shows the 2 land temp groups and the divergence. Does anyone know the absolute global mean temperature predicted by Hansen’s code (not the anomaly) – how does this compare to the “actual” absolute global mean temperature. Hansen doesn’t do that. He has a standing post at GISS on why it’s virtually impossible to even define a global surface absolute temperature, and why anomalies are essential. Hansan has help. Lots of help. Billions and billions of dollars worth of help. Not all to him, of course, but to people and groups that think along the same lines. Who are you assuming will be in the new administration? With maybe one or two exceptions the likely candidates will probably continue with business as usual. Wrong. Emissions have been exponential. The fact that the CO2 rise has not been is just one more example of the failure of Hansen to understand the climate system. The emissions that he has actively tried to reduce have followed scenario A (or worse). I love to see this kind of cognitive dissonance. It shows how CAGWers bend reality to fit their beliefs. Very telling. Instead of scrapping the space shuttle, NASA should scrap GISS. Please. Only those that offer counter predictions are allowed to debate this? Yeah, that’s science at its best. BTW, based on what I’ve read from Christy he HAS clearly stated that the Earth is warming, just not primarily due to human influences. Your final paragraph is even more precious. So as long as I get the sign of a problem right, I’ve got the right answer?! OK, I predict US GDP will grow for the rest of the year. When do I get my Nobel? Hansen’s slope is clearly wrong and even more so when you compare the actual CO2 emissions and the predicted temperatures. If Hansen had been in charge of the Apollo Program the moon landing would have been in Fort Lauderdale. Would that not constitute a 100% proof by contradiction? Why does your graph stop in 2005? And even with 2010 in record territory (barely), Scenario B is toast. I notice that Village Idiot weighed in with “who cares about 22 years ago” and Hansen defenders come out of the woodwork arguing “if ands or buts” to try to show that he was right. “Today, I will testify to Congress about global warming, 20 years after my June 23, 1988 testimony, which alerted the public that global warming was under way. There are striking similarities between then and now, but one big difference. Hansen’s a con artist. No matter what happens, he’ll insist he predicted it. Has anyone reminded him lately that he predicted the West Side Highway would be under water due to rising sea levels by last year? I have never understood how Hansen got away with the “adjustment” of the GISS records back in 2000, where the 1930’s were demerited and shrank to temperatures colder than the present. That, (and also Mann’s demeriting of the MWP,) have always struck me as “cheating.” They seem such a flagrant disregard of scientific objectivity that I feel there needs to be some sort of punishment for it. Instead people are, it seems to me, far more patient with Hansen than he deserves. I cringe when I think of all the tax dollars he has blown. I would like to interview all the people who have worked with him at NASA over the past two decades, “adjusting” temperatures. Surely one could be found who would tell the truth about what went on. People are far too kind to Hansen. He ought have the book thrown at him. No – not in this particular case. 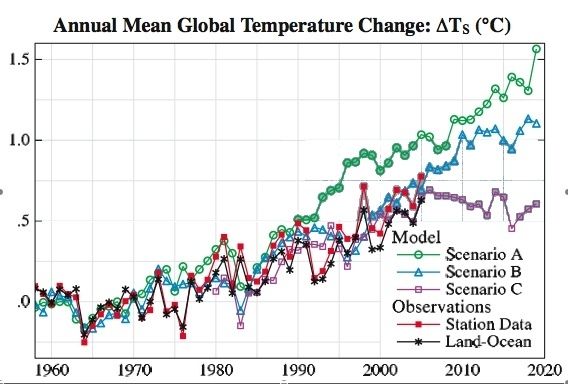 Hansen’s model predicts (or predicted) the surface temperature trend. John Christy has used the UAH LT record to “mimic the surface temperature variability and trends according to published climate model simulations” . He needs to explain how this is relevant to Hansen’s model. If global absolute temps are a virtual impossibility, then why not invent an anomalymometer, and do away with useless thermometers? I don’t need a tarmac thermometer to tell me that it is unbearably hot on my rooftop in summer. So…even though all of thermodynamics associated with atmospheric heat transfer depends on absolute temperatures, they don’t want to deal with that at GISS. For example, would the radiation heat transfer be different if the average surface temperature is 55 F vs 60 F? So why, again, are anomalies essential? And, again, how do they calculate the surface integral of the anomalies in the GCMs? Where are the node points in the computational mesh located? Do they even care? Hmmmm…let me check their documentation…ooops…. 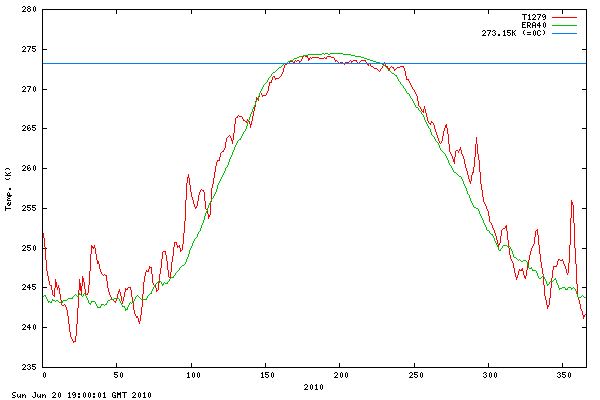 It looks unusually warm in the Arctic in James Hansen’s temperature set this year. Yet it may have been the coolest summer on record there this year. In 1988 they opened the hearing room windows so the air conditioning would be overcome. Now they are dropping Arctic temperature stations so cooling in the earth is overcome. I suggest you reread Hansen’s paper and testimony again more carefully since you are mistaken. In particular look at Fig 2 and reconsider your statement that the GHGs continued to increase at the same rate. What do you mean by this. Either there are one or more groups other than RSS and UAH or there isn’t. You say there are, so supply ID and preferably links. It’s making the data fit the agenda — in other words, fraud. If Hansen’s own boss admitted Hansen was way off in more than one way, why is he still getting an audience? Hansen said the B scenario was the most plausible but we didn’t get B for the CO2 values, they were at or above A as has already been pointed out. So he was wrong on the most plausible scenario and we got between C and B temperatures from A+ CO2 input, so he was wrong about the sensitivity of the climate to CO2. So you agree with Monckton about a linear increase in CO2 then. But w r t Hansen you are confusing concentrations with emissions. Emissions have not been linear. It was only good if you omit the last five years, deprecate scenario A and use modelled GIStemps rather than the measured satellite temperatures. At least Christy’s multiplier is based on solid physics, whereas Hansen’s 1200 km extrapolations and arbitrary adjustments are just based on hand waving and a mis-use of statistical formalism. Nope. Here’s the AR4 graph. Ups and downs, but basically linear. Nonsense. Of course regular temp is used in modelling and analysis. But you need anomalies to calculate a meaningful global surface temp average, and hence global trend. Absolute temperatures are useful locally. However, on a global scale, absolute temperatures are not a good thing to use because they do not have very good properties in that they can vary dramatically over large distances, which means you need a very large distribution of closely-spaced stations to get an accurate result. Consider the weather station located at the top of Mt. Washington in New Hampshire and imagine a station located in a nearby valley. The two would record very different temperatures. The advantage of anomalies are that they are correlated over large distances. Thus, a much sparser set of readings suffices to determine the trends in the global temperature anomaly. Wrong. Emissions have been exponential. The fact that the CO2 rise has not been is just one more example of the failure of Hansen to understand the climate system. The emissions that he has actively tried to reduce have followed scenario A (or worse). Actually, emissions of CFCs were cut even more drastically than Hansen could have possibly imagined. You have to include all parts of the equation. Also, in terms of CO2, the question is not just linear or exponential but how fast an exponential. I.e., if emissions increase 1% year-upon-year or 3% year-upon-year, both yield exponential growth but with different factors. There are separate issues to consider in terms of how well he did predicting CO2 levels on the basis of emissions vs how well he did predicting climate on the basis of CO2 levels. You seem to be claiming that there was some major error in the first part. Do you have evidence to back this up or are you just talking off of the top of your head? Here’s why it doesn’t matter if Dr. Christy was as skilled as Hansen in predicting the state of climate 20 years latter. We didn’t pass any laws based on Christy’s erroneous judgment. We passed laws that literally affected the entire world based on Hansen’s erroneous judgment. I do not understand the distinction. On the basis of Dr. Christy’s and Dr. Spencer’s flawed analysis of the satellite temperature record, there was a considerable period of time when it was erroneously claimed that the troposphere was cooling…and this likely played a significant part in delaying the sort of laws of which you speak. Now, if you don’t like such laws, you might think that delaying laws is not a bad thing. However, for those of us who don’t like people freeloading off of us by using fossil fuel energy irresponsibly (e.g., driving Hummers on their city commute to work) because they can offload the consequences onto the rest of us, that is not a good thing. I would prefer to have these people pay for the full costs for their decisions, so that they will hopefully make more responsible decisions (or, so even, if they don’t, they at least bear the full cost of their irresponsible decisions themselves rather than having everyone else share the cost). That is what market economics is supposed to be about, but alas things have been co-opted by what I call “free market fundamentalists” who believe in “free markets” as a religious tenet rather than believing in the (social) science of market economics as understood by economists. Can anyone tell me what “skillful” means. Mann talked about skillful in his “reconstruction” of temperatures to the medieval period. Then he could produce a skillful reconstruction. Good question. I just tried to research this by looking at the U.S. Climate Change Science Program’s report on Temperature Trends in the Lower Atmosphere ( http://www.globalchange.gov/publications/reports/scientific-assessments/saps/291 ). It turns out that, as I vaguely remembered, there are two other groups that have analyzed temperature trends, at U. of Maryland and U. of Washington. However, it seems that both these groups just report trends (or corrections to trends) for the middle troposphere, not the lower troposphere as is being talked about here. I do think that at least one of those groups was arguing that the way that UAH was determining lower troposphere (LT) temperatures still has some contamination from the stratosphere (where the temperature trend has been quite strongly negative, as expected due to decreased stratospheric ozone and increased GHGs), and I believe there is still an ongoing debate about this, but from what I can tell from that report the only two numerical trend values that we have for the LT are from UAH and RSS. So, those are apparently still the only two games in town for actual numerical trends in the LT. Probably a distinction without a difference, but there’s a definite bow in that curve. Anyway, it’s the total ghg forcings that should be considered, not just CO2. Either way, Scenario B (if you consider now and not 2005) looks pretty bad. Hansen adherents have admited that he overestimated ghg sensitivities in 1988. Why keep trying to salvage Scenario B? Perhaps like the Hockey Stick, too much invested in it? And when you get to the models, there are parts of the temperature that cannot be explained by anything but CO2, right? Why can meteorology explain the physical reasons (humidity is this, this much sun, and so on) the temperature is 75F tonight, but the models can’t? Might the process remove information from the data (outliers come to mind as one possibility)? You certainly wouldn’t find out by looking through the data that something was missing if that was the case. How do you have a global temperature anomaly with no global temeperature? Wouldn’t the averaging of global anomolies imply an average global temp using the same method. Being virtualy imposible to calculate a global surf temp, would that not also imply a virtual imposibility to calc a global anomoly? Why do you need anomalies? I think the argument goes that surface temperatures vary greatly with position but somehow anomalies don’t. They are magical in that they vary smoothly. Why can we assume this smoothness? And what thermodynamic principal permits us to take a surface integral of anomalies – is that surface integral meaningful? At what level is surface integral evaluated – does it matter? Good we agree that Christy was erroneous and others had to clean up his analysis of the UAH satellite data, in (was it?) 2004. We did, however, fail to pass laws, in part because of Spencer and Christy’s botched analysis of microwave sounding units, which they used to impune Hansen’s thermometers. Now Spencer and Christy are on board that the earth is heating, but Christy is still hammering Hansen. It is an infantile behavior. The climate models have moved on since 1988. Why doesn’t Christy? I know, I’ll take the MSU analysis Christy used in 2000 and use that to estimate post 2000 surface temps from the post 2000 MSU raw data and compare to the results of the current UAH analysis of post 2000 temps. How ‘skillful’ would Christy appear to be then? Are you, Sexton, in disagreement with Spencer and Christy about whether the Earth is now warming? If you think it is warming, what is causing it? If humans were a cause, would it make sense for governments to pass laws to mitigate and accommodate the effects? What is Christy currently asserting the temperature will be in 2060? It would be good to have rational estimates; will it be hotter or colder than this year? Does he claim that there is no way to make a reasonable estimate? Is the Earth’s temp just a random walk? According to Spencer satellite temperatures may have an error of up to half a degree Celsius, but that error would stay the same. And UAH is not synchronized to ground data. But changes of temperature are exact to within an error of 0.01 °C. Thus one can compare anomalies. Hummer drivers get fuel for free in the U.S.? Joel, you should really up the ante re the “offloading the consequences on the rest of us”; don’t stop with punishing Hummer drivers. You need to get all combustion engines outlawed if you want to achieve what you think is necessary. Concentrate citizens near their place of work and force them to bicycle to work. Every car driver is a criminal according to your logic. Joel, you should really up the ante re the “offloading the consequences on the rest of us”; don’t stop with punishing Hummer drivers. You need to get all combustion engines outlawed if you want to achieve what you think is necessary. It is not about punishing people and outlawing things. It is about internalizing the externalized costs so that people make choices based on those costs rather than offloading the costs on everybody else. It is about the assumptions under which markets produce the most efficient outcome and when those assumptions fail. It is basic market economics…Look up “externalities” in any intro economics textbook or on the web. Joel S. – Thank you for the clarification of the satellite temps. Society does bear some burden (costs) that result from the actions of others. It is unavoidable. But generally, if a real cost is incurred – such as loss of health for example – those costs can at least be compensated for via the courts; so there is a mechanism in most cases to adjust for “distributed” costs. I feel that we as a society should be willing, in general, to suffer some consequences of what is, net-net, a positive improvement in our standard of living and quality of life. But beyond that, the problem with the government assigning external costs to this or that activity is that the government must first understand the true costs of a given activity or technology. Generally, people smart enough to completely understand complex systems do not exist. Therefore, it is better to take a laissez-faire approach and let the courts handle any non-obvious consequences. You asked “What does ‘skillful’ mean?”. It’s a technical term used by computer modelers. Stripping out a whole bunch of verbiage, a model is considered “skillful” based on how well it predicts. The point is that Hansen’s original models don’t do too well versus the later measurements. 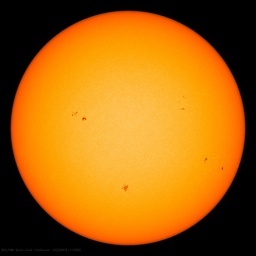 it seems that the surface record must be regarded with suspicion, too. So I would claim that Dr. Christy’s use of a simple factor is probably not a reason to write this post off. PS: I haven’t googled for those neologisms of mine, so it’s possible that some have been independently invented. It is wrong to claim that Theon was Hansen’s supervisor in any realistic use of the term. Apparently, Theon was a bureaucrat reasonably high up in the bureaucracy at NASA who had some responsibility for funding of various agencies within NASA, including GISS. Honestly, what do you really know about John Theon? You asseverate that “it is wrong…” blah, blah, blah and then you start your next sentence with “Apparently…” , meaning you went and looked up what somebody had to say about it. Just as I did. In the 1960s and 70s, Theon worked at the Goddard Space Flight Center, performing meteorological research. At NASA from 1982 until he retired in 1994, he was responsible for all the agency’s climate and weather research, including the work of James Hansen, Roy Spencer, Joanne Simpson, and several hundred scientists at NASA field centers and in academia. He is a fellow of the American Meteorological Society, and an associate fellow of the American Institute for Aeronautics and Astronautics. He was twice awarded the NASA Exceptional Performance Award, and received the Radio Wave Award by the Minister of Posts and Telecommunications of Japan for his contributions to the joint U.S.–Japanese Tropical Rainfall Measuring Mission. So far, you seem to have brag rights, Roger. Your quotes about Theon (which aren’t from an official Wikipedia page, by the way, but only one specific user’s page) don’t really contradict anything that I said. Theon did have a successful career as a researcher in meteorology, but that essentially ended about 30 years ago, after which he spent 12 years in an administrative role, after which he retired. As near as I can tell, none of his own research was in the area of climate change. While he is entitled to his opinions, I don’t really see how his administrative role back in the 1980s up to 1994 nor his meteorology research career in the 1960s and 1970s particularly qualifies him to make the pronouncements that he has, so I don’t understand why we are supposed to endow them with so much weight. As for being a fellow of the AMS and having won two NASA awards and such, well that’s great, but James Hansen is a fellow of AGU and has received many NASA awards…plus, he has received awards from AMS, APS, AGU, and AAAS ( http://www.columbia.edu/~jeh1/HansenCV_200912.pdf ) and the difference is that Hansen’s are recent and for his work in the particular field that we are talking about. How does that basic economic analysis justify the current tax system where 47% of U.S. population don’t pay any “externalities”? Liberals pay for what they want, not what is “efficient”. Don’t attempt to justify your ideology with economics. Thanks for the short post here to review some of the prediction; excuse me, that’s projection history from Dr Hansen. At WUWT you are likely to raise more discussion than in ANY peer reviewed Journal. So would you consider giving us a short update on the status of the study of ocean buoy near surface (-1 metre) water and (+3 metre) air temperatures, that you reported on in Jan 2001 in I believe Geophysical Research Letters; wherein you reported not only that the water and air temperatures during that 20 or so year period gave different amounts of warming; but you also reported that they were not even correlated; which to me would mean that all of the previous 100 years or so of oceanic water temperatures; could not be rectified to recover oceanic air temperatures dating back to the beginning of global temperature recording. It would be nice to know what the data has been showing since 2001, if you have time to fill us in. Based upon the actual temperatures, we have done better than the proposed “drastic reduction” of GHGs. So if we continue with this “drastic Reduction” then we should be seeing even better results than the blue lines? New campaign Ad – Drive a car to save the world! I completely agree that Theon’s opinion, (which he’s fully entitled to express) of Hansen and/or his opinions is a complete red herring, but it was a fish that you had casually cast at and it seemed your line was tangled. I enjoy your stuff on physics. Back in college, Jeremy Rifkin came by to do some class presentations. He took us all outside where we took off our shoes and sat on the grass, then he regaled us with tales of wondrous village life with tight-knit communities (circa the Dark Ages in Europe). His most memorable item, which has stuck with me, was how after a wedding the next day the bed sheets would be hung out for public display so people could tell the bride was a virgin by the blood on the sheets. Well the problem with anomalies is that they compare inadequately sampled spatial and temporal Temperature data to some 1961-1990 baseline that itself is an inadequately sampled data base. So we don’t have any idea what the true mean global Temperature was at any time during that 1961-1990 base time frame; let alone what the true average was; and since the sampling regimen is inadequate; there is no basis for believing that the anomalies some how tell us how the whole globe is changing temperature. If the original baseline sampling strategy conformed both temporally, and spatially with the Nyquist sampling criterion; then we would know what the true global average was over that baseline period; but we don’t because the average is corrupted by aliassing noise. And that same aliassing noise corrupts every subsequent computed “average” in a quite unknown manner. And if the whole earth continued to report zero anomalies; that would still tell us exactly nothing about energy flows in the environment. You have to have Temperature differences to have energy transport certainly in the form of heat and you need real Temperatures to know anything about the radiant energy flows. Let’s face it; on average nothing happens. So Joel are we to presume that you don’t ever use any fossil fuels irresponsibly ? Is somebody who goes fishing in other than a sailboat using fossil fuels irresponsibly ? Who among us is so smart that we are able to judge what is responsible and what is not. Was it responsible for The President to take his family swimming in a Florida Bay and then tell the American people that they were swimming in the Gulf of Mexico; when they were doing no such thing, and the beach they swam at had never had ANY oil Contamination from the Gulf spill. He could have taken his daughter swimming in a Washington DC swimming pool; or maybe the Potomac river; and saved all that fosslil fue on Air Force One. You should be careful of judging other people’s daily lives; lest yours become the subject of scrutiny to see that you are not doing anything the elites want you to not do. I used the example of the person with a Hummer to point out an example of someone who is disproportionately benefiting from having their use of fossil fuels subsidized, but I believe that all of us are having the choices distorted from those that we might make if we paid the full costs at the point-of-sale. And, I’m not trying to pass moral judgments on other people’s choices; I am trying to correct a problem that exists in the current market system that is distorting the choices that people make (by having us all collectively bear the costs and thus effectively subsidizing those choices). I don’t understand this comment. Are you saying that 47% of the U.S. citizens don’t pay gas taxes, sales taxes, payroll taxes, property taxes, the portion of corporate taxes that is passed on to consumers (which is presumably most of it), or any other taxes? In fact, some people have argued that carbon taxes or higher energy costs due to cap-and-trade would disproportionately hurt the less-well-off, although I would prefer to try to fix the externalities and then offset any disproportionality by other means. I think what you are referring to is the percentage that don’t pay federal income taxes (which is, in contrast to payroll, sales, and some other taxes, a tax that is actually progressive rather than regressive). And, the fact that such a small share of the wealthiest Americans pay the majority of the federal income taxes is due in largest part to the fact that they have such a large fraction of the income and to a considerably less extent due to the fact that the federal income tax (as opposed to the other taxes that I mentioned) is in fact somewhat progressive, taking a larger proportion of income from the rich than the poor. But the equities of tax policy are, in my mind, largely separate from the issue of correcting large externalities in the market that may result in us doing considerable damage to our environment. If I might externalize a little bit here, I’m wondering who to scowl at the most as I cycle along; the guy in the Hummer taking his grandmother to the hospital, the soccer mom heading to Starbucks in her mini-van, the dude in the Elantra running for a pack of smokes or the Mack trucker with a load of garden tractors. (1) The temperature values in the evolution of the scenarios (A, B, C) will not exactly match Hansen’s pub because I have referenced them to a particular 5-year period (which represents the start of the satellite data.) They are the same values, but just relative to a different reference period, so appear shifted up or down relative to Hansen’s pub. (2) To do an apples to apples comparison, we could compare the tropospheric values from old model (evidently not available) and satellites (available). To keep the apples to apples comparison valid we can use the model amplification factor (troposphere is 1.2+ times the surface) and either (a) multiple A, B, and C by 1.2 or divide the satellite data by 1.2. Either way, the plot is the same in terms of divergence – we chose to divide the satellite data by 1.2. (3) NOAA-16 does not impact the trend of UAH (or RSS) data since it is not used as a component in the backbone. (4) This diagram was made because there was a recent comment that suggested Hansen’s 1988 forecast was accurate. (6) Through 1994 the satellite trend was slightly negative which prompted our Letter to Nature (Christy and McNider, 1994) to show how Mt. Pinatubo had tilted the trend to the negative, and once that was accounted for (along with El Chichon and ENSOs) the trend was in fact +0.09 C/dec. For the past several years the trend appears to have settled down to +0.14 +/- 0.02 C/dec. any opinion on Zou’s work? Having worked extensively with marine data, I concur with Christy’s view about the lack of correlation between air and sea temperatures. Yes, you get a seasonal cycle in both of them that is reasonably coherent, but at frequencies both lower and higher the lack of coherence is what really stands out. That’s one of the many reasons why I consider all pre-satellite-era land-and-sea temperature anomaly series to be an excercise in data manufacture. Thanks for your reply in which you addressed some of my comments. Here are some further comments on your responses. Okay…I know you have to line things up somehow but I am just wondering if that relative shift could be somewhat of a problem. Their pre-1998 analysis method gave a trend of -0.076 C / decade for the Jan 1979 – Apr 1997 data (as per their 1998 paper that I linked to); their current analysis gives +0.029 C / decade for that same data … That is a change in trend of +0.105 C / decade due solely to changes in their analysis. Since the trend for the full data set we now have through Dec 2008 is +0.127 C / decade, the change due to the longer time series is +0.098 C / decade. Thus … a tiny bit over half of the change in trend is due to changes in the analysis, not the longer data series. I noticed that my link to the 1998 is no longer working. Here is one that seems to: http://journals.ametsoc.org/doi/full/10.1175/1520-0442%281998%29011%3C2016%3AAOTMPF%3E2.0.CO%3B2 Just to be clear, that 1998 paper reports a new trend of -0.046 C / decade for the January 1979–April 1997 period but notes that this is a change from -0.076 C / decade over the same period with the previous analysis procedure. As of January 2009 when I looked at the data, the latest version of the UAH analysis gives a trend of +0.029 C / decade for the January 1979–April 1997 period.